Nico Hulkenberg and Felipe Massa have finished as the fastest drivers in the two Friday practice sessions for this weekend’s Russian Grand Prix at the Sochi Autodrom. Running was limited after a Diesel spill forced the drivers to use wet tyres in practice 1, with practice 2 then being affected by a downpour. Practice 1 at the Sochi Autodrom was unusually shortened by half an hour after track officials cleared up a large Diesel spill on the track. It appeared as though a circuit truck had spilled the Diesel onto the circuit, with the marshals spent the first half hour of the session clearing away the spillage by washing the circuit at turn 8 with water. Once the drivers got out on track, all the drivers elected to run either the Intermediate or Wet tyre compound due to the conditions after the spillage. A smattering of drivers attempted to use the dry tyre compound, with the results proving to be a nerve-wracking and treacherous few laps for Marcus Ericsson, Max Verstappen and more. There was no meaningful running until the final quarter of an hour, with Nico Hulkenberg ending the session as the surprising fastest driver in the Force India. He ended the session half a tenth faster than 2nd placed Nico Rosberg and 3rd placed Sebastian Vettel. The second Force India driver Sergio Perez was also right at the sharp end in 4th place; 7 tenths off his team-mate. 5th and 6th fastest were Daniel Ricciardo for Red Bull and Carlos Sainz for Toro Rosso. During the session, news was reported by German press that Ferrari had decided not to supply engines to Red Bull for next season and that they would supply Toro Rosso. Team principal Christian Horner was quick to deny these reports, stating that offers were still on the table for both teams for next season. These decisions have massive implications as to whether or not Red Bull are on the grid next season. All the way down in 7th was Lewis Hamilton, who was among the last to set lap-times. 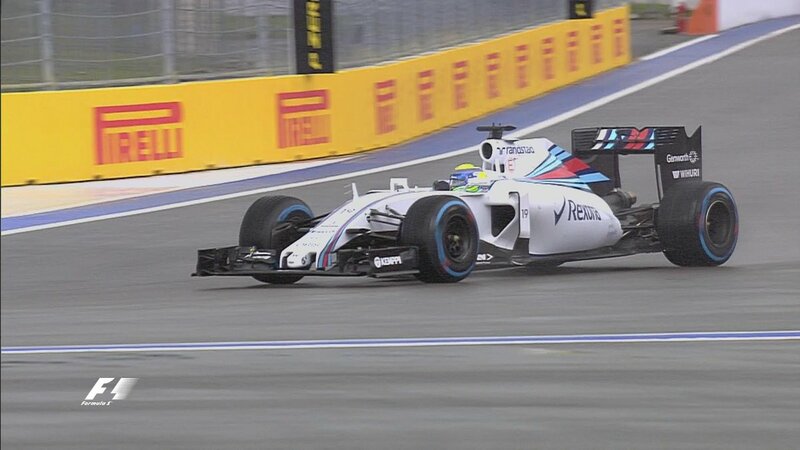 He didn’t get a proper effort in after having to avoid Felipe Massa’s spinning Williams, before spinning himself later in the lap. Valtteri Bottas would be just behind him in 8th, with Max Verstappen and Kimi Raikkonen completing the top 10. After practice 1’s running was ruined by the oil spillage, both the drivers, teams and fans were hoping for a dry and uneventful session so that some meaningful mileage could be achieved. This didn’t look to be on the cards after a significant shower hit Sochi just before the start of the session, confining all but 2 drivers to their garages for much of the session. Sebastian Vettel and Fernando Alonso were the only two to venture out on track within the first half hour, with Fernando heading out for a second time later on to sample the circuit. With 50 minutes to go, half of the lap was soaked, with the other half quite dry. Alonso would end up being the first driver to set a time, but his 2’01.077 was way off of dry pace. Valtteri Bottas and Nico Rosberg soon also dared to go out on track, with Rosberg attempting a practice start at the end of the pit-lane as the rain came back again. Neither would set a lap-time, with Lewis Hamilton heading out on track just as Rosberg came back in. Once again, Hamilton would start a flying lap but would pit at the end before setting a time. 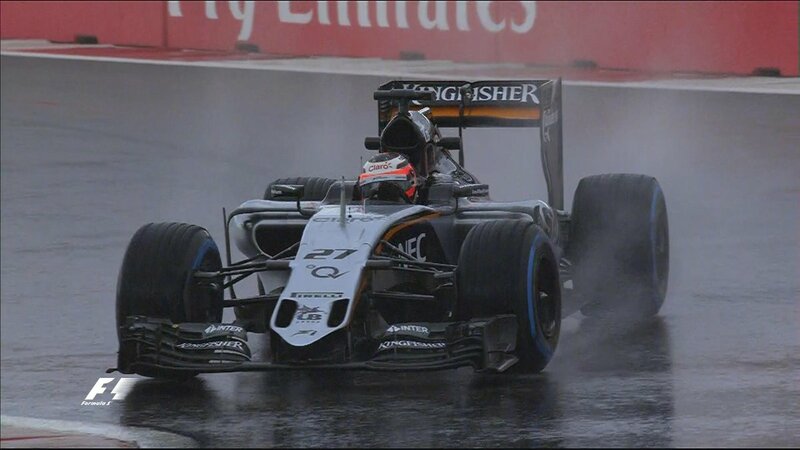 A trend of this season continued as Toro Rosso elected to send their drivers out in the wet in practice. Max Verstappen and Carlos Sainz put themselves 2nd and 3rd, with the pair initially unable to match Alonso’s benchmark from earlier in the session. Max was able to put himself at the front on his 3rd lap, as he went 2 tenths faster than the 2 time world champion. In the final 10 minutes, a number of other drivers would finally get their names on the time-sheets, with Kvyat moving himself up to 3rd in front of his home crowd, and Button putting himself 5th out of the 5 runners. Within the final few minutes, Valtteri Bottas just pipped Max Verstappen to take the top spot by 2 hundredths of a second. He would hold onto this position as the checkered flags came out as he improved by a tenth, but then he would be shoved down into 3rd as his team-mate Felipe Massa took P1 with his very last lap; despite having been caught asleep in the cockpit earlier in the session. Sebastian Vettel would split the two Williams in 2nd place in his Ferrari. Max Verstappen would hold onto 4th after being pushed down from the top spot in the last few moments. Fernando Alonso, who was fastest for much of the session, finished down in 5th having been told by the team that they had a problem in the closing stages of the session. 6th would go to Daniil Kvyat ahead of Carlos Sainz, with Jenson Button completing the list of drivers who set a lap-time. The remaining 12 drivers did not complete a lap. The lack of meaningful running means that pressure will be on the teams to get as much work done in tomorrow’s 1 hour of practice before qualifying for the Russian Grand Prix begins.